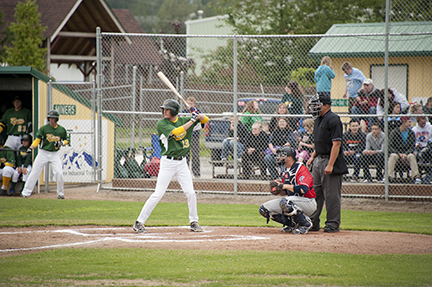 The Mat-Su Miners play at Hermon Brothers Field throughout June and July. When people think of Alaska, the first things to come to mind are usually the mountains, vast wilderness, wildlife and amazing scenery. But here&apos;s a little secret - Alaska is also home to some fantastic baseball every summer, as the Alaska Baseball League takes center stage at ballparks around the state. The Valley is home to the Mat-Su Miners, who play their home games under the watchful eye of Pioneer Peak, at Hermon Brothers Field (on the fairgrounds). For my money, there&apos;s no better view from a ballpark in the country than the vistas you&apos;ll see at Hermon Brothers Field. Miners baseball is affordable and very family-friendly, making it a perfect summer activity. With home games throughout June and July, there&apos;s plenty of chances to catch the team in action. The Miners, like all the teams in the Alaska Baseball League, are comprised of collegiate players on summer break. They come to Alaska because professional scouts come to Alaska - it&apos;s a chance for them to be seen while playing against some of the top competitors in the sport at that level. Unlike their college teams, the Alaska Baseball League is a wood-bat league, giving scouts the opportunity to see how these players perform under situations they&apos;ll face in the Minor and Major Leagues. Historically, there have been some amazing players come through Palmer and the rest of the Alaska Baseball League. Former MLB all-star players like Mark McGwire, Nolan Ryan and Dave Winfield have all played in the ABL. The current manager of the Milwaukee Brewers, Craig Counsell, is a former Mat-Su Miner. The players taking the field during the ABL season may someday take the field at a Major League Park. The Mat-Su Miners start their season June 10, and tickets are available at the gate. For more information on the Miners, check out their Web site at www.matsuminers.org. Play ball!